Dr. Daniela Huber is senior fellow at IAI in the Mediterranean and Middle East programme where she is the scientific co-coordinator of the H2020 project MEDRESET, co-work package leader in the H2020 project EU-LISTCO, editor of The International Spectator, and mentor in the Gem-Stones project. 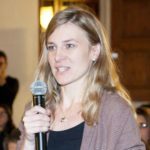 She holds the Italian national habilitation to function as associate professor in Political Science, a Ph.D. from the Hebrew University of Jerusalem, and an M.A. in International Relations from the Free University of Berlin. Her research interests include EU and US foreign policies in the Middle East, the regional and international dimension of the Israel/Palestine conflict, and contemporary politics in the Middle East. Daniela Huber, “Youth as a New Foreign Policy Challenge in MENA. A Critical Interrogation of EU and US Youth Policies in Morocco and Tunisia”, European Foreign Affairs Review, 22:1, 2017, p. 111-128. Daniela Huber, “Israeli Regional Perspectives and the Mediterranean”, in Richard Gillespie and Frederic Volpi (eds. ), Routledge Handbook of Mediterranean Politics, Routledge, 2017, pp. 120-131. Daniela Huber and Lorenzo Kamel (eds. ), The Arab Spring and Peripheries. A Decentring Research Agenda, Routledge (2016). Daniela Huber, Democracy Promotion and Foreign Policy – Identity and Interests in US, EU and Non-Western Democracies, Palgrave Macmillan, 2015. Daniela Huber and Lorenzo Kamel (each 50%), “Arab Spring. The Role of Peripheries”, Mediterranean Politics, 20:2, 2015, p. 127-141. Lorenzo Kamel and Daniela Huber (each 50%), “Arab Spring. A Decentring Research Agenda”, Mediterranean Politics, 20:2, 2015, p. 273-280. Daniela Huber, “The US Response to the Arab Spring”, Journal of European Integration, 37:1, 2014, p. 57-75. Sandra Poggoda and Daniela Huber (each 50%), “India’s Peacebuilding Between Rights and Needs. Transformation of Local Conflict Spheres in Bihar, Northeast India, and Jammu and Kashmir?”, Journal of International Peacekeeping, 21:4, 2014, 443-463. Daniela Huber, “U.S. and EU Human Rights and Democracy Promotion since the Arab Spring. Rethinking its Content, Targets, and Instruments”, The International Spectator, 37:3, 2013, 98-112. Lorenzo Kamel and Daniela Huber (each 50%), “The De-Threatenization of the Other. An Israeli and a Palestinian Case of Understanding the Other’s Sufferance”, Peace and Change, 37:3, 2012, 366-388. Daniela Huber, “Democracy Assistance in the Middle East and North Africa: A Comparison of US and EU Policies”, Mediterranean Politics, 2008, 43-62.